When we talk about pictures we are taking, have taken or are going to take, most often we do so in terms of what that picture is of. We talk about that amazing giraffe, or the beautiful river winding through the landscape, the smiling child or the delicate flower. We rarely describe a picture by explaining the way the light was at that moment. And yet light is the most important element of any photograph, so perhaps that is what we should be talking about and when we go shooting that’s what we should be actively seeking out. 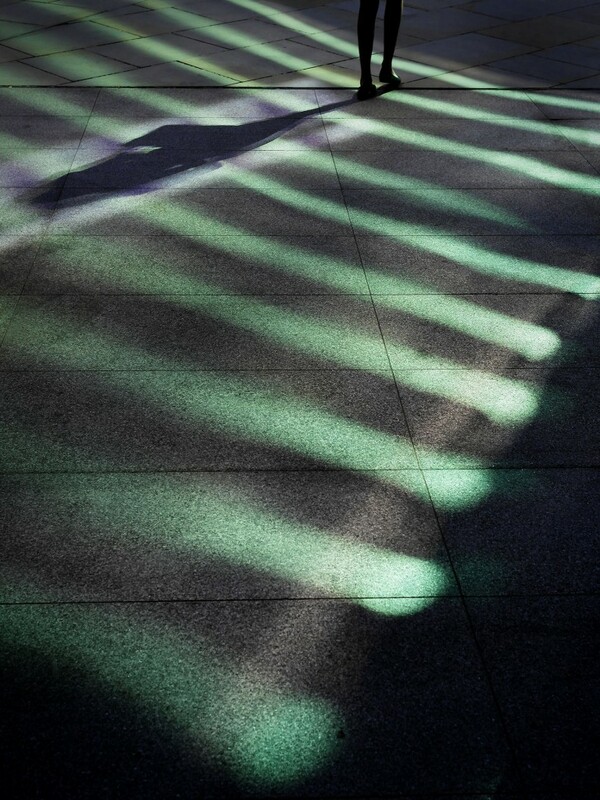 I shot this picture because I liked the way the morning sun was reflecting from the side of a modern office building in London, creating these coloured stripes on the pavement. It was the stripes and their colour that made me stop, and they inspired me to take the picture. The stripes aren’t an object, but they are the subject of the picture. These pretty coloured bands are enough on their own to make a picture – an abstract set of lines bending from one side of the frame to the other – but I wanted to add some human life to the scene for scale and extra interest. I noticed that as people entered or left the lit patch they cast their shadow across the stripes, making a shape perpendicular to the flow of the scene, and creating a number of intersections that drew the eye. I waited for the right person, with the right shape, to walk into the right place in the scene, and was reasonably quickly rewarded by this girl strolling into the area that cast her shadow between the green stripes, over the more brightly lit and colourless zone. Her shadow fits perfectly, and as her head’s shadow entered the frame her feet, with the catch-lights on her shoes, were preparing to make their way out. Everything came together in a cocktail of luck, anticipation, planning and patience. To make the most of the colours of the light I had to take control of the camera’s exposure system. To the camera this is a dark scene that needs lightening. To my brain it was a scene in which the lightest areas needed to be a more moderate brightness so that the colours wouldn’t bleach out. I had to make a dramatic adjustment with the camera’s exposure compensation feature, turning the brightness down to -1.7EV. I have black in the scene, and there are light tones that are close to white. 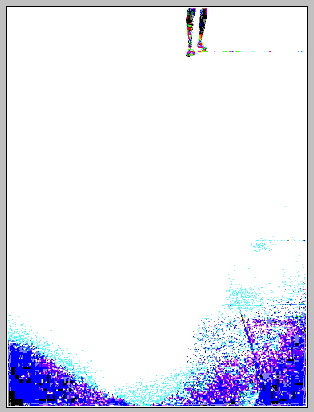 Although the picture looks very dark there are actually few real blacks and the histogram shows tones right up to 252. It is a picture of light, and the exposure has to take that into account. Your camera is designed to take pictures of cats, humans, trees and buildings, so when you want it to just shoot light you need to take full control and tell it very clearly how to do it. Your brain is much bigger than your camera’s so don’t allow your camera to take charge of the situation. Join me for a street photography class and learn first-hand how to take pictures like this. Choose between daytime classes and classes in the evening and into the night. For details see my street photography workshops page. Samsung NX20 with the 30mm lens. Did you find the post interesting or useful? Please let me know by leaving a comment. Thanks. A class among the colourful lights and characters of London’s Soho district. This bustling area always delivers excitement, atmosphere and plenty of great pictures for the photographer with the correct approach.